Stage 10 had pretty even odds between attackers and sprinters, and with 15k to go, Phillipe Gilbert’s Green Jersey and Thomas Voeckler’s Yellow Jersey were joined by HTC’s Tony Martin, Cofidis’s Tony Gallopin, and Quick Step’s Dries Devenyns took a dig off the front. Gilbert was the most committed – hunting a stage win for maximum Points – and Tony Martin the most flaky, trying to skip pulls since he should have been back in the bunch pulling things together for Cavendish. In the end, Leopard-Trek’s Jens Voight earned his burritos at the front and pulled them back. Gilbert’s failed move meant that he missed out on collecting any significant Points, which may be a blow to his hold on the Green Jersey (especially with Cavendish and JJ Rojas takins 2nd and 3rd, respectively, in the finale). Was his move, therefore, ill-advised? Or, as is sometimes the case with racing with panache, a calculated risk that was just unsuccessful? Regardless, Gilbert is making his mark on the Points Competition. Can he keep his lead until Paris? Quick Step’s Dries Devenyns has had an impressive Tour, with top-tens on hard stages and some aggressive racing, including looking pretty committed to today’s late attack. Will it pay off with a stage win? When the move was reeled in, the stage was set for Omega Pharma-Lotto’s Andre Gripel to bring home the biggest win of his career. In a head-to-head sprint against Mark Cavendish, Greipel took home the win he’s wanted to for a long time – beating Cav and finally winning an A-level sprint. Is this win enough to justify his two years of smack-talking? Is Greipel finally a world-class sprinter? Has he always been? One wonders how much Cavendish needs his leadout train – some say he’d be almost as dominant without it, but today, he was isolated in the finale, and got beaten. Rabobank’s Robert Gesink continued his run of bad luck, with an early crash and a mechanical. Rabobank leads the team competition on the strength of Luis Leon Sanchez’s stage win on Sunday. Will he be their GC man from here out? Further questions abound today as Katusha’s poor performance continue with the removal of Alexander Kolobnev. Is Tchmil’s great Russian Experiment a sinking ship? Furthermore, RadioShack’s Popovych has abandoned – their squad is looking increasingly decimated, with Popo and Horner out, Levi pretty far behind, and Kloden with some aches and pains. Can they steal a stage win for redemption? Tomorrow’s stage 11 is the first of only three remaining sprint-likely (coefficient 1) stages. Can Cavendish close the gap to Gilbert in the Points Comptition? 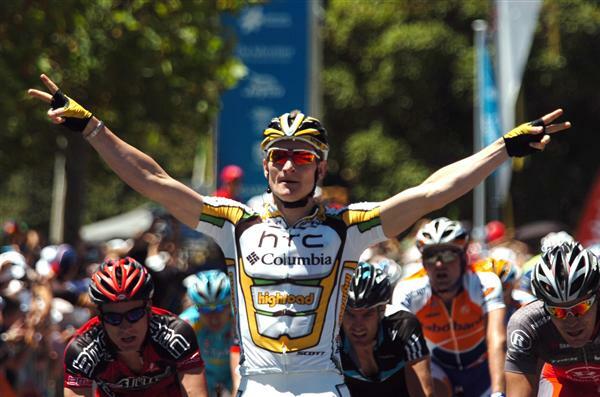 Can Greipel repeat? Can Rojas continue his stealthy creep toward Green? This entry was posted in Featured, Races and tagged 2011, Cavendish, gilbert, greipel, tour de france, voeckler, wrap-up. Bookmark the permalink. Oh how I loved watching Greipel win today, all smiles, ear to ear. In my opinion he's always been a world class sprinter, and by world class I mean physically capable of beating the best riders in the best races. Greipel is a big guy, and navigating the climbs as he has these last few stages, can't be easy. Today was his day and he had the fire. I think there was very little Cav could have done to keep that monkey (or Gorilla) off his back wheel. I'll take the bait above… Cav, I think, relies pretty heavily on a leadout. No doubt Cav is a fast guy, but I personally think you could put any of the top 10 sprinters on that back of that HTC train and they'd be successful. HTC's command of the last 20k is second to none, Cav can argue he is the fastest sprinter in the world (and he may well be), but I think the prize for best leadout train is without question HTC. Gesink looked much better then the recent day in a short interview (Eurosport), and said that it was the first day (today) that he felt much better after all the suffering he experienced after the big crash in the first week. Sure, Cav got beaten, but only by half a wheel. I don't know why the conventional wisdom that Cav is a typical sprinter with an atypically good lead out train keeps resurfacing, because he's proven it false again and again. Even in this very Tour, his train fell apart with a k to go, but Cav came from way back to win anyway. The difference the HTC train makes is that Cavendish goes from being extremely good to nearly unstoppable. I think maybe the reason for the belief that it's mostly the train does come from the fact that the HTC sprint train is so good. Joe says " I personally think you could put any of the top 10 sprinters on that back of that HTC train and they'd be successful," and that may be true, but what does that have to do with how he does without the lead out? Don't get me wrong, I'm not a squealing Cavendish fan by any means – if for no other reason than a dominating rider can make the sprints a bit less exciting – but give the man his due: he is simply far and away superior, as a pure sprinter, to his main rivals. It does look like he's set to be less dominant this year, I will admit, but he's still pretty clearly number one. As for Greipel justifying the smack and being a world-class sprinter: if you're capable of winning a stage in the Tour, you deserve to race in the Tour. 'Nuff said, really. He's no Cav (and I would argue that losing the HTC train has hurt him more than it ever does Cavendish), but changing teams was clearly the right move for him. I'm really happy for Greipel that he finally got his win, since he really seems like a hard working lad and always a bit overlooked one. And I must say, perfect team work by OmegaPharma-Lotto. I really cannot get enough of Gilbert and his panache he displays every time he hits the big ring. That attack really obliterated htc's train, even if Cav made it with the pack over the hill. (That's another good skill of Cav besides his fast legs, he really seems to have the fighting spirit to go through tough situations) And even if Cav has the ability to sprint on his own, missing such a lead out as Renshaw is always a minus point. And about htc's superior train, I think it's not only the good and great riders they have in it, I think a huge part belongs to Erik Zabel coaching that train. There is that anecdote Aldag told, Zabel said after reconnaissance of the a Tour stage finish to the team that there will be house behind the last corner which one could no see entering, but that would be their navigation point and they should not break. Later after they won the stage Hincapie walked up to Zabel and said "I nearly shat my pants, I never thought we would make it through that corner. I've never been so afraid in my life on a bike." – "But did you brake?" – "Hell no!". Well, Greipel did have Cav to lead him out, after sitting on his wheel for ages. Perhaps he could convince Omega to sign Cav up as his main leadout man for next year.